Learn about the SharePoint indexing connectors, the connector framework, and how you can create custom BCS indexing connectors to search external systems. Search in SharePoint provides two approaches for processing queries to return search results—federated search and content crawling. You require no additional capacity requirements for the content index, because content is not crawled by Search in SharePoint. You can take advantage of a repository's existing search engine. For example, you can federate to an Internet search engine to search the web. You can optimize the content repository's search engine for the repository's specific set of content, which might provide better search performance on the content set. You can access repositories that are secured against crawls, but that can be accessed by search queries. Control how frequently the content index is updated. Specify what metadata is crawled. Perform a single backup operation for crawled content. The crawler uses indexing connectors to access the content to crawl. The indexing connector is the component that knows how to connect to the content source, what to crawl, and how to crawl it. In earlier versions of SharePoint, these were known as protocol handlers, components that are based on custom interfaces running unmanaged C++ code. Search in SharePoint includes a connector framework, introduced in SharePoint Server 2010 and built on Microsoft Business Connectivity Services (BCS), which provides a simpler approach to developing indexing connectors. With the connector framework, the crawler uses indexing connectors based on BCS to crawl external content. SharePoint uses both protocol handler-based indexing connectors and BCS indexing connectors to crawl content. 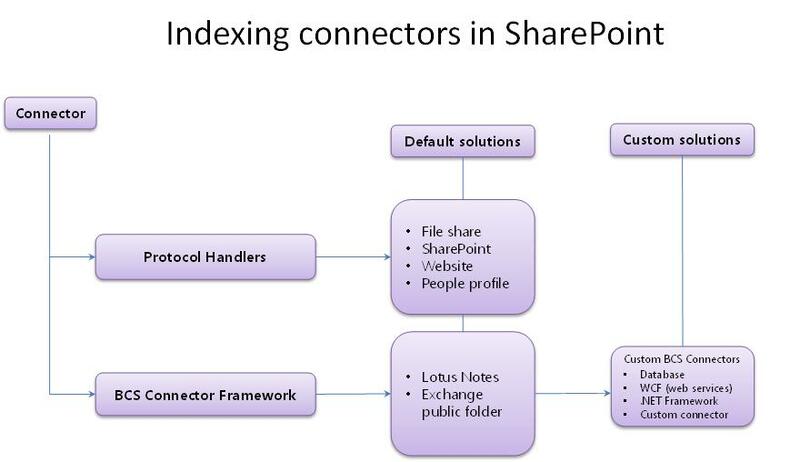 Figure 1 provides a high-level overview of the SharePoint indexing connector story. BCS is the umbrella of tools and infrastructure that enables you to connect to external systems from SharePoint. Figure 2 shows a high-level view of the BCS architecture, with the relevant areas for Search highlighted. Connectivity information Describes how to connect to the external system. Entity information Describes the structure of the external data. Operations Describes methods used to access the external data. In the case of databases and web services, these are methods supported by the external system: SQL statements for database connectors and web methods for web services. For .NET and custom BCS indexing connectors, these are methods that are implemented in the connector assembly, which is the component DLL you create for the indexing connector. This information is specified in the external content type's BDC model file. For more information about BDC models and what they contain, see BDC Model Infrastructure. For details about BCS architecture and functionality, see Business Connectivity Services Overview and Mechanics of Using Business Connectivity Services. To crawl external data, you have to add one of the content source types that support connecting to external data. Table 1 lists these content source types. Use this content source for database and web service BCS indexing connectors. Use this content source for .NET and custom BCS indexing connectors. The connector framework enables you to create BCS indexing connectors to connect to external content that you want to crawl and include in the content index. The BCS indexing connector is used by the crawler to communicate with the external data source. At crawl time, the crawler calls the BCS indexing connector to fetch the data from the external system and pass it back to the crawler. 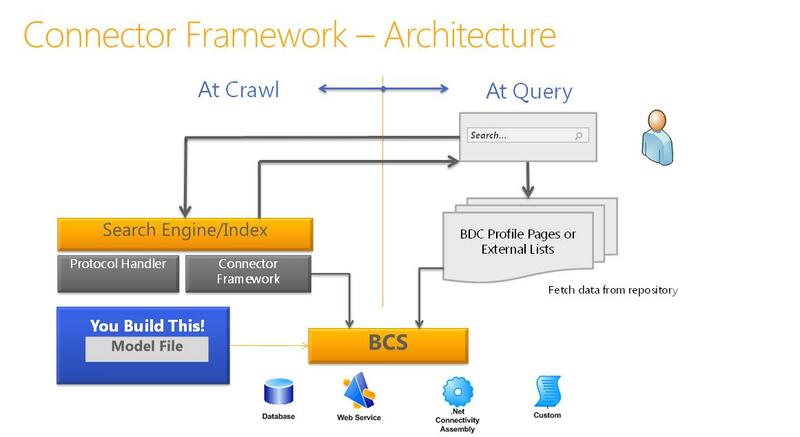 The BCS indexing connector also parses the access URLs understood by Search and the identifiers understood by BCS as they are passed between BCS and Search during the crawl process. The BDC model file The file that provides the structure of the data, and that provides connection information to the external system. The connector The component containing the code that connects to the external system and parses the access URLs and BCS identifiers. For BCS indexing connectors based on the Line of Business Data content source types, Search includes built-in connectors, so you have to create only a BDC model file. For BCS indexing connectors based on the Custom Repository content source types, you must develop a custom component in addition to a BDC model file to connect to the external data. Figure 3 shows a high-level view of the search connector framework architecture. Database connector SharePoint includes a predefined BCS connector that supports connecting to databases, so you can create a database BCS indexing connector without writing any code—just create the BDC model file for the connector. 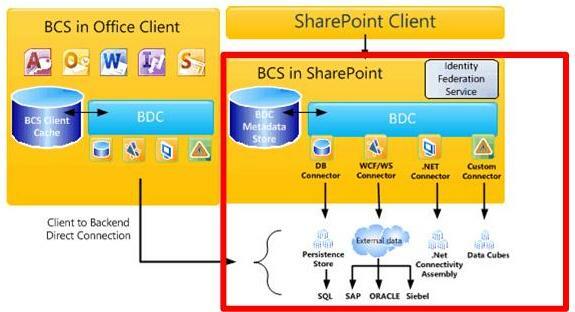 WCF (web services) connector SharePoint includes a predefined BCS connector that supports connecting to web services, so you can create a web service BCS indexing connector without writing any code—just create the BDC model file for the connector. Although you don't have to write code to create a connector for web services, the web service must include methods that provide the same functionality that the .NET BCS connector provides, to pass the external business data to BCS. For information about creating a web service, see Creating .NET Connectivity Assemblies and Web Services. For code examples, see Sample Orders ASP.NET Web Service Sample and Sample Orders WCF Service Sample. .NET BCS connector SharePoint does not include a predefined BCS connector for .NET connectors, so in addition to creating a BDC model file, you must also create a .NET component for the BCS indexing connector. You must implement the required stereotyped operations to support crawling the data, and implement methods for parsing the access URLs and BDC identifiers. Custom BCS connector SharePoint does not include a predefined BCS connector for custom .NET connectors, so in addition to creating a BDC model file, you must also create a .NET component for the BCS indexing connector, just as you must for the .NET BCS connector. You must implement the required stereotyped operations to support crawling the data, and implement methods for parsing the access URLs and BDC identifiers. You must also implement the ISystemUtility interface. Connectivity How to connect to the external data repository, for example, the server address, IP address, or database instance name. Also includes the authentication information used to connect to the external data repository. Structure of repository To read the data, the connector must know how the repository is organized. Is it hierarchical, enumerical, or does it have to traverse links? Incremental crawls To reduce the performance load on the external data repository, give the connector the ability to do incremental crawls in addition to full crawls. For this, the connector must recognize what data has changed since the last crawl and be able to crawl only that data. This can be done by using a timestamp-based incremental crawl or a change log-based crawl. The approach you implement depends on the APIs provided by the repository and the freshness goals for the content. Securing data In most scenarios, not all data is accessible to all users. It's important that this also works with search, so when a user searches by using the search UI, the user can see only the results he or she has access to. This means the connector must know how to read the security of the external system, and bring that security-related information back during the crawl into the index. For example, you could implement crawl-time storage of Windows NT access control lists (ACLs). Table 2 describes the stereotyped operations that apply when you create a BCS indexing connector for SharePoint. Core operation required when creating a BCS connector. This operation retrieves the list of items of the external content source. See Implementing a Finder. Core operation required when creating a BCS connector. This operation retrieves individual items from the external content source. See Implementing a SpecificFinder. Required to implement changelog-based incremental crawls. See Implementing a ChangedIdEnumerator. Required to implement changelog-based incremental crawls. See Implementing a DeletedIdEnumerator. Required to implement item-level security. Returns the security descriptor for an item from the external content source. See Implementing a BinarySecurityDescriptorAccessor. Required to enable crawling of attachments from the external content source. Returns the attachment as a data stream. See Implementing a StreamAccessor. BCS provides tooling support for BCS connectors in SharePoint Designer and Visual Studio. SharePoint Designer provides a limited set of capabilities; you can use it to create BDC model files for existing BCS connector types, such as database, web service, and .NET BCS connectors. You can also use it to export BDC model files from one BCS service application to another BCS service application. You can use Visual Studio to create the component for .NET BCS connectors and custom BCS connectors. For .NET BCS connectors, Visual Studio provides the Business Data Connectivity Model project template, which includes a set of visual designers and code management capabilities to enable you to more easily create, debug, and deploy the .NET component and the associated BDC model file for the .NET BCS connector. There is no corresponding project template for custom BCS connectors. In SharePoint the connector framework supports BCS connectors retrieving claims information for content that is stored in custom external data repositories. The connector framework also provides improved exception capturing and logging to help you troubleshoot errors encountered when crawling content sources by using BCS connectors.